Scientists from UC Berkeley have recently discovered that a strange naturally occurring bright display of the ‘disco’ or ‘electric’ clam Ctenoides ales is actually a photonic display created by a layer of silica nanospheres. The display functions solely by reflecting light. An article was published in the Journal of The Royal Society titled “A Dynamic Broadband Reflector Built from Microscopic Silica Spheres in the ‘Disco’ Clam Ctenoides Ales“, where the researchers shared their findings. Laboratory elemental analysis of the reflective nanospheres showed that they are indeed composed of amorphous silica. Both the outer shells and the cores are composed of silica. Silica nanospheres are secreted by the animal and used as a light scattering structure in a behavior modulated reflective photonic display. The measurements show that the diameter of the silica nanospheres is at around 300nanometers, an optimal particle size for scattering visible light, especially the shorter blue-green wavelengths of 400-500nm that predominate at 3-50m underwater, which is typically the clam’s habitat. In addition to the diameter, the highly organized packing structure of the nanospheres aid in the scattering of the visible light at the shorter wavelengths. The display is so bright that it has been mistakenly thought of as bioluminescent, but the findings show that it is actually based on light scattered by photonic nanostructures. Silica has a high index of refraction at n=1.43 at 589nm. This study is extremely interesting to scientists in many different fields because it opens their minds up to many creative uses of silica nanospheres that have not been known before. The findings show a practical way to manipulate light in low light situations. Among its other advantages, silica, similar to glass, is a very durable material, with high melt point. Using silica nanospheres in tightly packed arrays to create photonic nanostructures seems like a great idea. Highly precise and spherical silica nanospheres with narrow size distribution, diameters around 300nm and sphericity of greater than 99% in dry powder from can be purchased from CosphericNano—a new website specializing in precise silica nanospheres. Silver Coated Glass Microspheres work well for increasing the conductivity of bond lines, but they lack the capability to deform when compressed to give increased conductive contact between the surfaces of the bond line. These newly released Silver Coated PMMA Microspheres offer the low weight deformable pmma cores, and 250nm thick silver coating for high conductivity. Conductivity of this product has been measured at <0.5ohm per square with a 30% by volume preparation. Sizes available cover both the common 50 micron (45-53um) and 100 micron (90-106um) sizes and many others. These spheres are perfect for producing anisotropic (only conductive in one direction) conductive bond lines. Actual bond line thickness achieved will be a function of the assembly pressure and the size spheres selected. In addition to being high conductive these silver coated PMMA is bio-compatible. What a creative alternative to power-hungry digital displays. This large outdoor billboard is totally environmentally friendly because compared to LCD and LED displays that run on electricity, this display takes no energy to run. This creative outdoor billboard is made with reflective tape, visible only when illuminated by headlights in the darkness, created by ad agency Cossette. To promote a local 24-hour McDonald’s in Canada, Cossette Vancouver designed this reflective billboard that’s only visible at night when cars pass by. By day, the billboard appears blank with no message, but at night, motorists driving along the highway reveal Mickey-D’s clever advertisement with their car headlights. Not only does this display save energy, it can be put anywhere, even in cities with strict requirements on flashing and lit displays. Even though this particular display was made using reflective tape, many types of retroreflective media can be made by incorporating retroreflective microspheres in a variety of substances. Retroreflective Microspheres are made by applying a half-shell aluminum coating on solid barium titanate glass microspheres. The spheres hemispherically coated with a thin aluminum shell produce a bright retroreflective response directed back to the light source. Black polyethylene paramagnetic microspheres are now available in wide selection of particle sizes ranging from 10 micron to 1.4 millimeters. The particles are supplied in dry powder form. No solvents are used in the manufacturing process. Black paramagnetic polymer microspheres have a strong response to magnetic fields and can be manipulated with a magnet. Highly opaque particles with maximum hiding power. When the filed is removed, the microspheres demagnetize and re-disperse easily. This property allows efficient washing steps, low background and good reproducibility. The behavior of the microspheres is always the same whatever the magnetization cycles may be. Such behavior is a key point for automated instrument. According to Wikipedia, paramagnetic materials have a small, positive susceptibility to magnetic fields. These materials are slightly attracted by a magnetic field and the material does not retain the magnetic properties when the external field is removed. Paramagnetic properties are due to the presence of some unpaired electrons, and from the realignment of the electron paths caused by the external magnetic field. Encyclopedia Britanica defines paramagnetism as a kind of magnetism characteristic of materials weakly attracted by a strong magnet, named and extensively investigated by the British scientist Michael Faraday beginning in 1845. Most elements and some compounds are paramagnetic. Strong paramagnetism (not to be confused with the ferromagnetism of the elements iron, cobalt, nickel, and other alloys) is exhibited by compounds containing iron, palladium, platinum, and the rare-earth elements. Paramagnetic microparticles are used in numerous applications where they can be manipulated with a magnet, observed and cleaned-up for reuse. 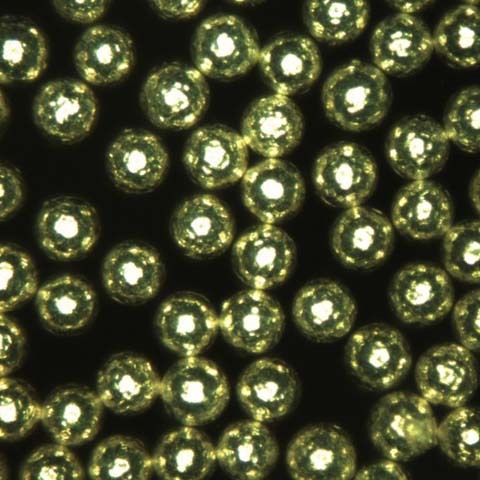 Santa Barbara, CA, December 6, 2013 – Cospheric LLC, a microsphere manufacturing and distributing company, expanded their line of density marker beads which now offers six different densities including 1.02 g/cc (fluorescent green), 1.04g/cc (fluorescent orange), 1.06g/cc (fluorescent violet), 1.08 g/cc (dark blue), 1.09 g/cc (fluorescent red), and 1.13g/cc (fluorescent blue). Cospheric Density Marker Beads are now provided at a 20% concentration in an aqueous solution in 2.5ml vials, which makes the spheres easier to work with for the customers. Microspheres of different densities can be purchased individually or as a density marker beads kit. Microspheres of accurately known mass density are generally used as an external marker to facilitate the monitoring of the density gradient shape and range. Density marker beads enable excellent stratification and bright coloration for high visibility with the unaided eye. Historically density calibration beads in the size ranges of 212-250um or 250-300um are used. Unlike the discontinued density marker kits which used to be manufactured by GE Healthcare and sold by Sigma-Aldrich, Cospheric’s DMB density marker beads are ready for use right out of the vial, don’t need to be swollen, do not expire, and do not change density over time. Cospheric’s DMB microspheres will create Percoll gradients but will also work with any other centrifugation media. The colored microbeads may be recovered and stored for future use. The density marker beads provide a rapid, simple, and accurate method for measuring the density. Generally a set of several such beads, covering a range of densities, is used. In the biomedical industry researchers are sometimes looking for cells having targeted specific gravities. In order to locate these cells in test tubes it is useful to have colored marker beads which will show where the delineation between specific densities occurs. Density marker beads are also used for calibrating particles in other industries, such as agriculture, microbiology and others. Cospheric LLC develops, manufactures, and distributes high-quality microspheres in sizes from 10 micron to 1000 micron (1mm). Cospheric specializes in polyethylene microspheres and carries a large stock of polyethylene microspheres in many colors, fluorescent, phosphorescent, neutrally-buoyant, and paramagnetic properties. Cospheric also offers a selection of soda-lime and borosilicate glass, silica, metal-coated, and titanium dioxide-coated spheres, some available in spacer grades with very tight particle size distributions. Cospheric LLC welcomes inquiries for custom manufacturing of microspheres tuned to each customer’s unique specifications. Cospheric is an eco-friendly company that uses only recyclable materials and no solvents in the manufacturing process. For more information, pricing and sample requests visit www.cospheric.com. 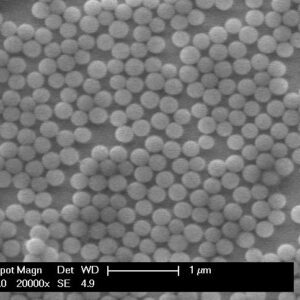 Microspheres or beads are spherical particles usually between 1 to 1000 microns in diameter and are manufactured for wide variety of uses in research, medicine, consumer goods, paints and coatings, adhesives, personal care, household products, cosmetics, skin care, and other industries.